Krakow native Robert Kubica suffered serious injuries when his Skoda Fabia S2000 crashed in the Ronde di Andora Rally on Sunday, 6 February near Genoa, Italy. His car hit a tree root protruding from the road on the first stage of the race, while driving at high speed along a section of wet asphalt. The vehicle has been impounded by Italian police. The accident resulted in multiple leg fractures and a severely crushed hand, among other injuries. The hand injury has raised the greatest alarm for the future of the 26-year-old driver’s career – doctors have not ruled out the necessity of an amputation. The results of an MRI scan to determine whether Kubica suffered internal injuries, including to the brain, have not yet been made available. Surgery has been performed to stop internal bleeding and to set the broken bones in his hand. When asked about the possibility of amputation, doctors at the hospital in Tescico stated that no decision had been made. The crash comes only weeks before the start of the Formula One season in Bahrain and just days after Kubica set the fastest test time of 13.144 seconds in Spain, ahead of Ferrrari’s Ferdando Alonso. His excellent pace bode well for the reorganized Lotus Renault team’s new car and Kubica’s personal form, drawing high praise from the international F1 press. 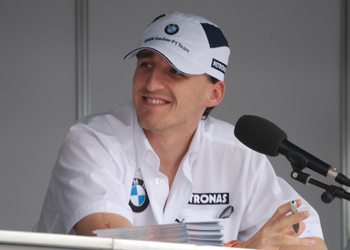 Kubica himself played down the promising performance with characteristic humility.